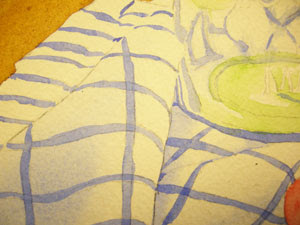 Using French Ultramarine Blue, I have added the lines on the towel. I tried to create each line with as few brush strokes as possible. This keeps the painting looking fresh and painterly. It's okay if the lines are not perfect. 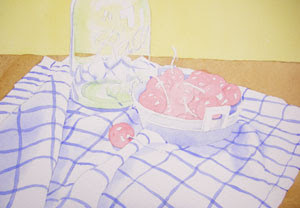 The towel is not the focal point for this painting. Too much detail, even in detailed work, becomes fussy-looking.